Epson’s original InkTank System printers now bring you even better performance while delivering ultra-low running cost. Save more with Epson’s low cost ink bottles even as you enjoy high quality printing. This is the range of most popular Epson All-in-one printers with various advanced features. You can see list of our Epson's most popular All-in-one Printers below, perform Side-by-Side comparison. If you need further help, do have a look at Conzumr Guides and Tips. Alternatively you can view all Printer and Scanner to choose your own favourites. Quality Print, Print more, Print Faster, Space-saving Design, Unsurpassed Print Quality, One Touch Scan and Copy, Superb Print Speed..
Epson’s proven original InkTank System delivers reliable printing with unrivalled economy. At just Rs.441 per bottle, Epson genuine ink bottles let you enjoy ultra high page yields of up to 4,000 pages (black) at very low running costs. Busy offices will appreciate the improved printing speeds of up to 27ppm for draft black & white, and up to 7ipm for default black & white prints. High volume printing has never been this quick and efficient. Space-saving Design, Unsurpassed Print Quality, One Touch Scan and Copy, Superb Print Speed. Epson’s original InkTank System Printers now bring even better performance for business users while keeping extremely low running costs. Save more money and time with Epson’s low cost ink bottles while increasing office productivity with improved printing speeds. Epson’s proven original InkTank System delivers reliable printing with unrivalled economy. At just Rs.441 per bottle, Epson genuine ink bottles let you enjoy ultra high page yields of up to 4,000 pages (black) at very low running costs. 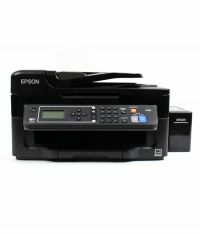 Bi-directional printer, Wireless Printing with Epson iPrint, Superb Print Speed and Reliability, One Touch Scan and Copy, Unsurpassed Print Quality..
Epson iPrint offers the convenience of wireless printing direct from your iOS or Android devices. With iPrint, you can easily print web pages, Microsoft Office documents, photos and PDFs over your home or office network. You can also scan and save onto your mobile devices, send as an email or upload to a cloud service such as Box.net, Dropbox, Evernote or Google Docs. Epson iPrint is free to download from Apple App Store and Google Play Store. Enjoy mobile printing at low operating costs along with Wi-Fi, Wi-Fi Direct and Epson Connect. Epson Creative Print - Get creative with your mobile devices. Use images from your mobile devices to create your own colouring projects. 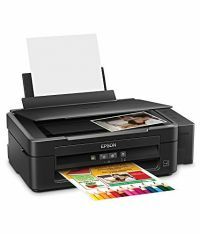 Epson Email Print - Print to any Email Print enabled Epson printer from any devices or PC with email access. Apple AirPrint - Enables easy wireless printing from your iOS devices. Google Cloud Print - Print easily from your Gmail or Google Drive account via your mobile devices. Mopria Print Service – Conveniently print across different brands of printers on mobile devices running Android OS 4.4 or later. Enjoy a variety of functions from scanning, copying and faxing to connectivity applications such as Ethernet, Wi-Fi, Wi-Fi Direct and Epson Connect. On-demand ink jet (piezoelectric): This technology uses a piezoelectric material in an ink-filled chamber which is behind every nozzle instead of a heating element. On-demand ink jet: In this on demand inkjet process, the print cartridges consist of a series of tiny chambers, each containing a heater that ejects the droplet from a chamber. 8.5 x 44" L220 : 8.5 x 44"
8.5 x 44" L360 : 8.5 x 44"
8.5 x 44" L365 : 8.5 x 44"
8.5 x 44" L455 : 8.5 x 44"
Epson iPrint: Printer with Epson iPrint brings greater convenience by allowing you to print web pages, important documents and photos wirelessly from iOS™ and Android™ devices. Google Cloud Print: Print anything from any device to practically any location. Google Cloud Print is a technology that make your printers available to you and anyone you want through web. Google Cloud Print makes it possible to send any document or image to a printer at one location (e.g printer at home) from a device/ phone/ computer at some other location (e.g. Document in the office PC). 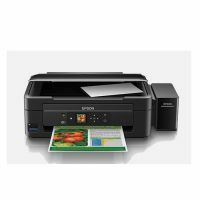 1.44 " L455 : 1.44 "
2.2 " L565 : 2.2 "
To Recieve updates and possible rewards for Epson L565 please sign in. To Recieve updates and possible rewards for Printer and Scanner please sign in.